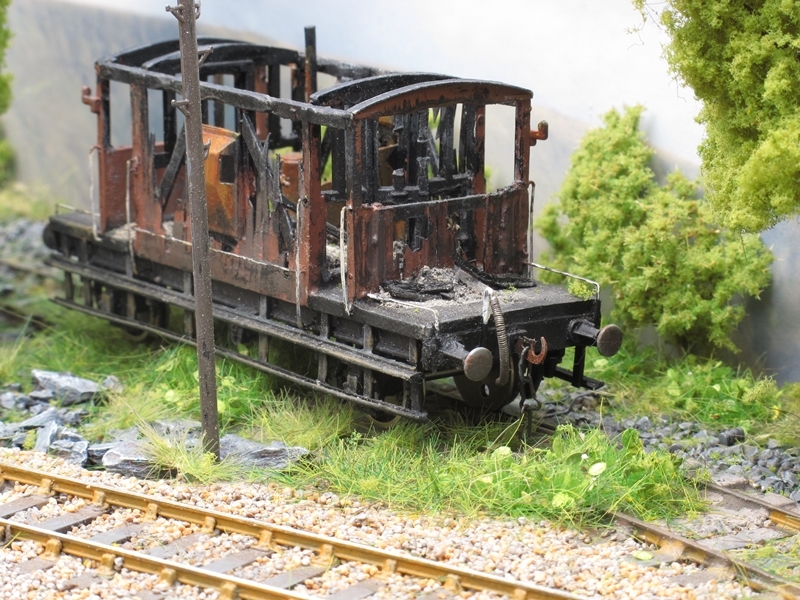 One of the dominant features of my previous layout Pen Y Bont, was a burnt out brake van. This item was always an item of great interest when I took the layout to exhibitions, the number of people who took pictures of it was amazing. Thing is though I have never seen any published on the 'net! 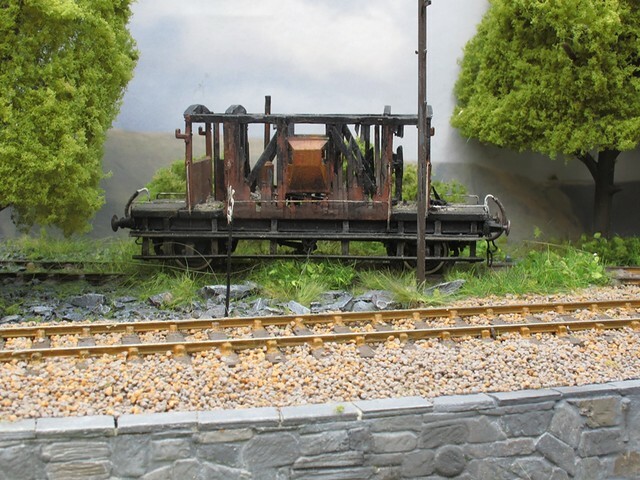 Anyway, the burnt out brake was not sold with the layout and has found a new home on Morfa Bach to "Rust in peace"
Parked in the disused ballast/PW siding one of my favourite features lives on! Have I lost my marbles? I have just purchased my very first Diesel locomotive! This is an historical event because like every Scots born Britain I have steam in my blood and have never had much time for railway locomotives of the internal combustion engine powered variety. "So" I hear you ask "what have you bought?" Well I haven't gone and lost the plot completely as my choice of Diesel loco was once common on the Cambrian lines. I have just purchased a second hand Bachmann class 24 in two tone green. That is about as far as it is going! There is NO WAY I shall go down the banger blue route! Anyway, back to my purchase. The class 24 came second hand from one of our local traders who visits our local club a couple of times a year flogging his wears. I managed to do a bit of a deal against some surplus Bachmann Mk1 coaches I had going spare. All I need to do now is add all the tiny detail bits that come in a little plastic bag (unopened in this case!) and fit working screw couplings. To be honest (and being labeled a Heathen by a certain Cambrian coast blue diesel modeller) I don't know that much about these paraffin burning devices so looks like a load of research to find out what I need to do to it to bring it to life, which I am going to find difficult because unlike a steam locomotive that really does live and breathe, a diesel locomotive is just so clinical and dead almost like a zombie. It sort of lives but at the same time is "dead" no atmosphere at all. Which brings me back to where I started, Yes I think I have started to loose my marbles! Cheers and thanks for reading todays drivel!